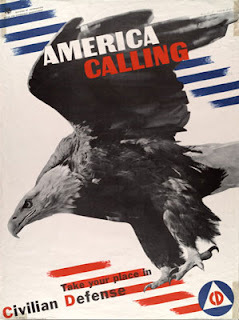 EagleSpeak: China: "The Cow's Tongue"
The Chinese military declared Friday that China had "indisputable sovereignty" over the South China Sea but insisted it would continue to allow others to freely navigate one of the busiest waterways in the world. The statement by the People's Liberation Army seemed designed to reiterate China's claims to the entire 1.3 million-square-mile waterway while calming concerns in Washington and Asian capitals that its policy toward the region had suddenly become significantly more aggressive. 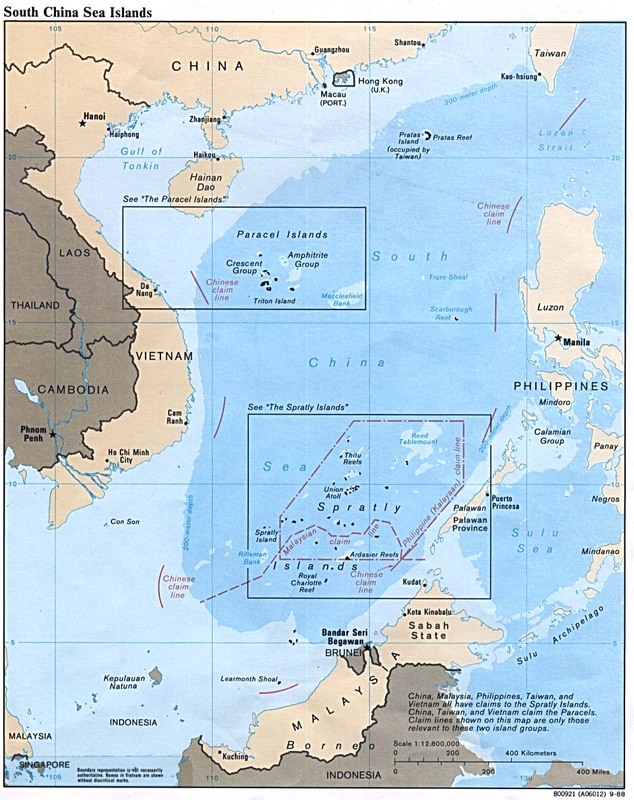 Despite China’s claims of ownership over the Spratly Islands, it never physically occupied this archipelago until 1988 when its navy clashed with Vietnam’s navy and took control of 6 of the features for the first time in history. 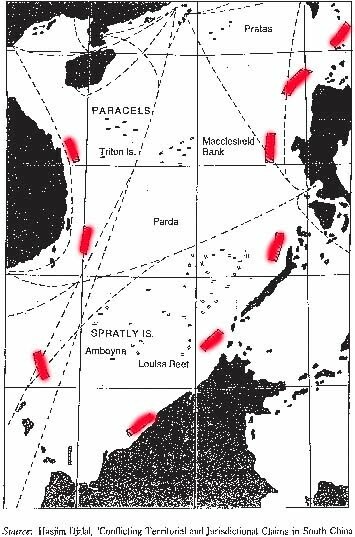 China continued to take over more features in subsequent clashes with Vietnam in 1992 and the Philippines in 1995. Despite only actually occupying a number of features in the Spratlys, in 1992 the Chinese National People’s Congress passed a “Law of the People’s Republic of China on the Territorial Sea and the Contiguous Zone,” in which it claimed all islands in the Spratlys (and most of the rest of the Eastern Sea) as Chinese territory. 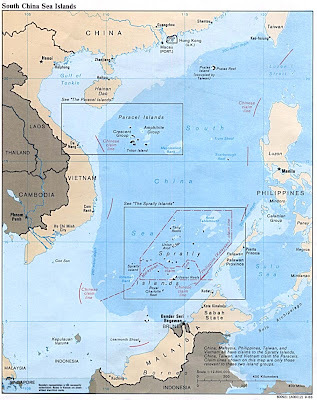 As mentioned earlier, China issued its dotted line maps claiming both land and "historic water" terrritories in the Eastern Sea giving it the whole sea up to a line ranging roughly 15 to 200 nautical miles from the coasts of the others. It is from this map that the boundaries around the claimed territories has the shape that reminds one of a “Cow Tongue”. 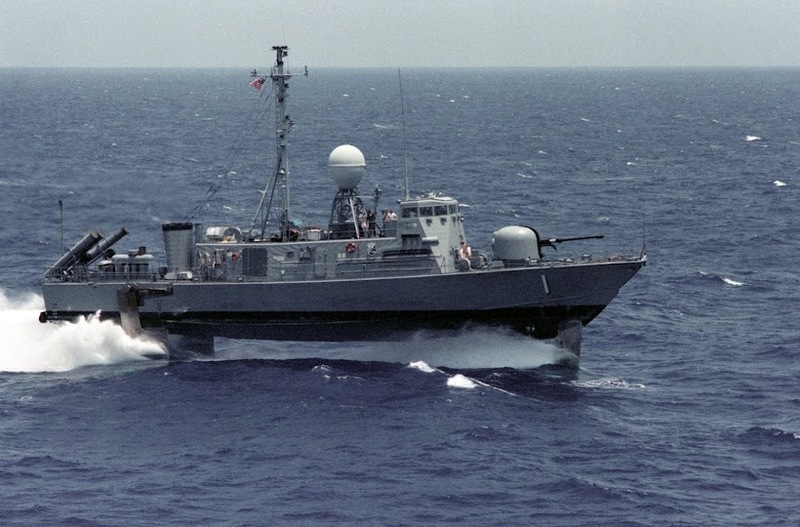 But recent reporting on an incident that took place in Indonesia's Exclusive Economic Zone (EEZ) suggests that Vietnam is not the only Southeast Asian country that has been prevailing upon the U.S. to engage more sharply on this highly sensitive issue. The August 3 edition of the Mainichi Daily News, a Japanese newspaper, reported on a June 23 confrontation over a fleet of 10 Chinese fishing vessels operating without permission in Indonesia's EEZ. A stand-off over the Indonesian navy's seizure of a Chinese fishing boat almost got out of control when a Chinese "fishery management vessel" – which was actually a repurposed heavy gunboat – threatened to fire on the Indonesian navy patrol boat. According to the article, the fishery management vessel pointed its large-caliber machine gun at the carbon-hulled Indonesian craft, at which point the outgunned patrol boat released the errant Chinese trawler. The article says that a similar episode occurred in May, with the same large Chinese warship having likewise successfully threatened an Indonesian naval patrol that was detaining an illegal Chinese fishing boat. 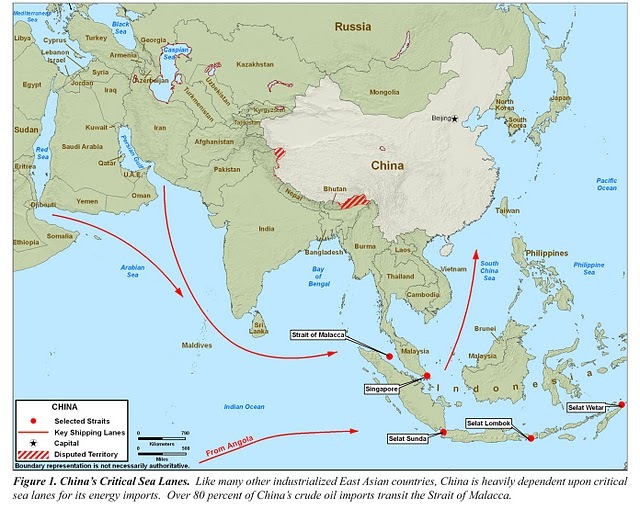 It isn't that the Chinese naval buildup is not one that a powerful nation can undertake, it's the bullying of lesser nations over valuable sea lanes, economic zones and challenges to sovereign rights that is problematic with the Chinese. And since the U.S. Navy is capable but lacks the numbers of potent warships to be everywhere, the Chinese may just bully their way into owning the "cow's tongue." of China’s South China Sea islands and the coastline of neighboring adjacent states. Second, the dotted line was the manner of designating a claimed national boundary line. Thus, “the nine-dotted line” had a dual nature. Not only did it define China’s sovereignty over the South China Sea Islands, but it also played the role of China’s claimed ocean boundary in the South China Sea. 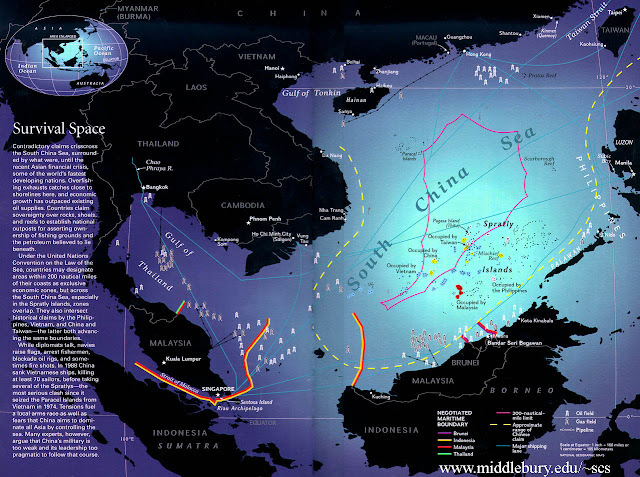 The lines therefore can be called the Chinese traditional maritime boundary line in the South China Sea. Update: added additional maps. Click on them to enlarge. UPDATE: You might be interested in the vital sea lanes of China (from here). Make no mistake about it — if the US chooses to press ahead in the region militarily and diplomatically there will be substantive challenges and an increased likelihood of a confrontation on the high seas. China has made no bones about using sharp elbows where it feels its sovereignty is being impinged and with increased capacity and capabilities, will undoubtedly feel it is in a position of greater strength to exercise the same. 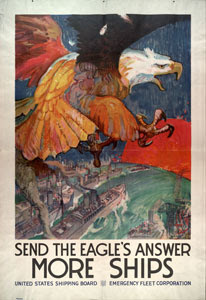 On the part of the US, it is the opening act of what a number of writers and strategists are coming to see as at least one major feature of a post-Iraq/Afghanistan world – one that requires a naval presence for persistent presence, able to flow forces on short notice that are able to conduct sustained operations from the seabase. It is the core of the maritime strategy and naval operations concept. It is also one that demands a navy with wide-ranging capabilities across the spectrum of war and which will not be found in a dwindling force of undermanned ships, aging aircraft and neglected weapons systems. It will require small combatants, big-deck amphibs, multi-mission destroyers and cruisers, submarines for hunting and deterrence and carriers that bring a revitalized mission of sea control back into a portfolio too-long dominated by strike warfare. Grey hulls, white hulls. Sailor, Marine, Coast Guardsman. The need is there — the question – can we afford to build and sustain the necessary force structure to put “paid” to the diplomatic checks being written?